Lookie here...I'm actually talking about running today! It's been over a month since I stopped training for my full marathon (that I eventually DNS), and I'm finally getting back into running regularly. My next big race is the Seawheeze Half Marathon in August, so training starts today! Each Monday, I'm going to recap my workouts, starting with week zero. On Wednesday, I'm going to talk more about my training plan and goals for this race. For now, let's see what I did in my final non-training week! I didn't run or exercise at all, but it definitely wasn't a lazy day! I finished cleaning up my old apartment, moving out the rest of our stuff, and helping my parents with their renovations. I would put this day in the strength training category! Nice and easy run around the neighborhood. I moved to a really hilly area, so I see a lot of hill repeats in my future! I really didn't want to go running because it was the hottest and most humid day we had in a while, but since it was Global Running Day I made myself go! I felt surprisingly good, like I'm getting my old fitness back! Sometimes the runs you don't want to do end up being the best. I took the day off running, but went on a long walk with Selma! It makes her really happy to go on walks, so this is the perfect rest day activity. I have a ton of workout DVD's that I stopped using once I joined a gym, so now that I don't have a membership I'm going to be using these again! Today I did Jillian Michael's Yoga Meltdown and it was NOT easy! Hello, summer running! The day started out cool, but by the time I finally got myself out the door it was hot and humid. Definitely need to start heading out early in the morning! I got my tires pumped up and went out for a long bike ride (long for me at least!). The weather was perfect and I'm starting to feel more confident riding! Hopefully I can keep adding on distance and hit my annual goal. Now I think I'm almost ready for training to start! Is anyone else training for a race? That yoga meltdown dvd really is tough! I’m looking to run my first half marathon in November, so I’ll be glued to reading your training recaps. I can learn from the best! I've always wanted to incorporate biking into my life, and you're motivating me to try it out. How long did it take to bike 5 miles? That's so awesome Julia! I can't wait to hear how it goes :) I honestly have no clue how long it took me..I didn't have a watch with me. I'm super slow though so probably at least 30 minutes!! I have that same Jillian Michaels DVD and it is tough. Every runner seems to be dealing with heat and humidity at the moment, but hopefully we will all be stronger for our fall races because of it! Yes I'm hoping that's the case! It has been so humid lately! I ran a race this past Saturday & while it felt good standing around before the race, once it started.. it was definitely so humid. Ready for better temps this week! Looking forward to reading your training recaps.. good luck! Glad you enjoyed your last days before training starts! Hopefully running in heat and humidity will only make you stronger! Exciting that you're starting to train for SeaWheeze this week! I love doing exercise DVDs at home, but my DVD player is broken and I haven't bought another. They're so cheap now so there's really no excuse not to. This post inspires me to get on that. Aw that's a bummer! Have you tried watching them on a laptop? A hilly neighborhood will fit right into your training plans. I often look for ways to avoid the hooks in mine. Does Selma like her new home? How exciting to be training for a half in the pretty near future. My next race seems so far away! Thanks for linking Gretchen! I'm so excited for you! And slightly jealous :) We have the same start week for race training, though. I think this was the first year in a while that I actually went running on Global/National Running Day haha. It just never worked out and I had other things planned. P.S. 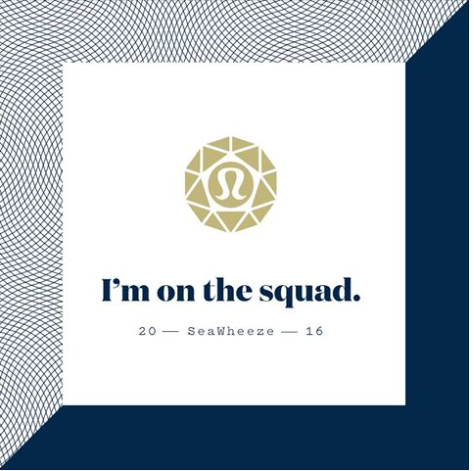 What month did you sign up for Seawheeze?! I think it was around September..it was only open for about an hour before it sold out! So crazy. As soon as the date was released I added it to my phone so I wouldn't forget! Good luck with training!! My week of workouts was somewhat relaxed. I did a pretty strenuous 14 mile hike Monday, an AM pilates class and PM HIIT class Wednesday, and HIIT class Saturday. Can't decide if I want to sign up and start training for a race soon! Seawheeze! I've always wanted to do that one. I'm doing a three local half marathons this summer - The first one is this weekend, EEK! Then July 2nd, and another one in late August. Last week I did 2 4 mi runs and 1 10 mile trail run and my goal for June is 15 minutes of yoga every day - So far so good! Yay for half marathon training!! I'm not really training for anything right now. Ragnar is in 4 days so I've been trying to just keep running 5-7 miles a few times each week. I've heard great things about SeaWheeze! I love reading posts on training :) I'm currently training for my first full marathon in a couple weeks ahh! I am just about finished running half marathons (my knee is not having it) but I feel like I might just get one in a year...we will see. Looks like you had a good week and yes renovations and cleaning out an apartment...totally strength training!! Good luck and I hope your knee feels better! I used to love Jillian Michael's Yoga Meltdown! It's a burner and it makes yoga fun, you know? Now I'm sort of tempted to dig it out and try it again. If Vancouver weather is anything like Seattle (which I think it is since they're only like 2 hours away), you shouldn't have too much heat or humidity for Seawheeze. Which makes any humidity you have now similar to altitude training and you'll just fly at Seawheeze! YES I am so happy you're writing about running again! I mean, I love it when you post pics of your outfits and makeup and stuff (my favourites!!!) but running tops it all. And I love how it's training week zero ha ha! Awesome. Great week for you Gretchen. I'm just plugging along in Summer mode right now. I won't try and build up miles until very late summer if I can stay in almost half marathon distance ready. Great week of workouts! I look forward to following your half marathon training! I will begin training for my third full next month. I am guilty of getting a late start on my runs too. I always regret it when I'm running in the heat of the day.